This is the 2nd year running this in Adelaide. Last year was great fun and we hope to get a bigger turnout for more fun this year. Now, if you’re thinking that theres no way you’re going to ride the train pantsless consider this… Improv Everywhere run this event every year in New York and last time they managed to get 900 people, thats right NINE HUNDRED, to go pantsless and for them its the middle of winter. In the Aussie summer going pantsless is actually more comfortable than wearing pants. Come and join us, do something unusual, be part of the ultimate inside joke and give the prudes of Adelaide something to gasp at. 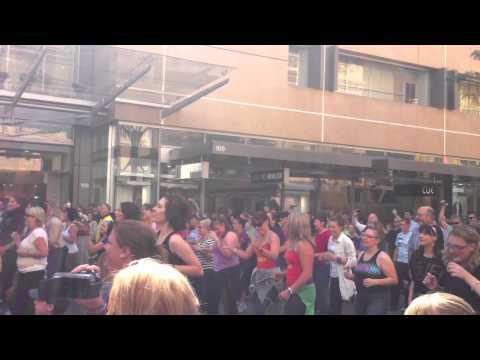 On Sunday 1st of March, The largest group of Ninjas ever seen will descend upon Rundle Mall! To ensure this is the biggest ninja run ever we will be putting up a lot of posters and handing out a ton of flyers. 2. We will be storming adelaide in a large group with several mini Ninja events down and around the mall. 3. Just before 4:00 we will have a Ninja photoshoot around the Mall’s Balls. Our events are not for everyone so the more people who hear about them the more chance we have of getting those who ARE interested to come along. You can help us out by mentioning our events in your normal day to day activities. If you Facebook then join our events and invite your friends along. If you Blog then write an entry about us and our activities. If you Stumble or Digg then drop us a hit. If you Email then spam all your friends about us. If you talk with friends, bring us up in conversation… every little bit helps. Your help, even the smallest amount of help, can make our event SUCCESSFUL!